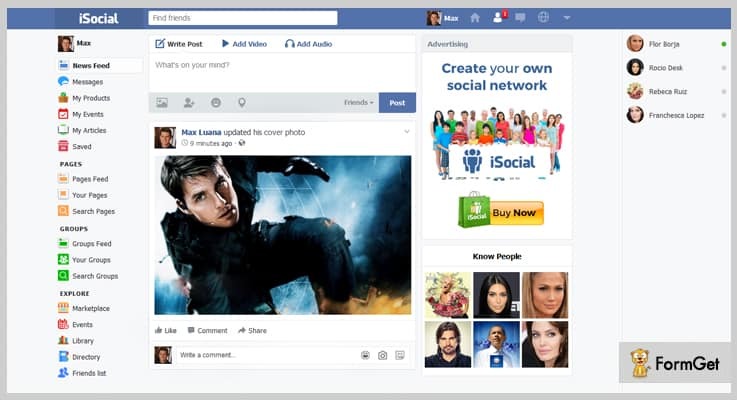 Do you want to create a social networking website like Facebook? If yes then, you are in the right place. In this blog, we have discussed 6 best Facebook clone PHP script using which you can create your own social networking sites without having any much knowledge of coding. Yes, you heard it right these PHP scripts allows your website visitors to register in your website for creating their social media account. Further, they can log in into your site with their respective username and password and do a live chat, video chat, create or like pages, upload images and make photo albums, and a lot more. The script provides a perfect design and user-friendly interface. Further, admin can make money with ads system. Here, admin can sell ads space to users and collect money using integrated payments gateways like Paypal and Stripe. Now, without taking your much time, let us discuss each Facebook clone PHP script in detail. WoWonder Facebook clone PHP script allows you to create your own faster and high-quality social networking website. The script provides you with a powerful back-end where you can manage all the posts and pages created by your users. In addition to this admin can view all the stats such as total post, users etc with charts and analyze full website with ease. You can provide ad space to your users where they can create or publish their own brand ads with ease. The script allows users to do live chats as well as video chats from your social media website. Admin can display the user’s latest activities such as likes, shares, comments, and more in the activity log section. The best part is your users can watch online movies on your website which were hosted on Amazon S3. Users can watch and import videos from various videos sharing websites like Vine, Soundcloud music and more. WoWonder Facebook clone PHP script is available at $72 with all the important features and supports up to 6 months. Extend your support up to 12 months by paying only $25.13. 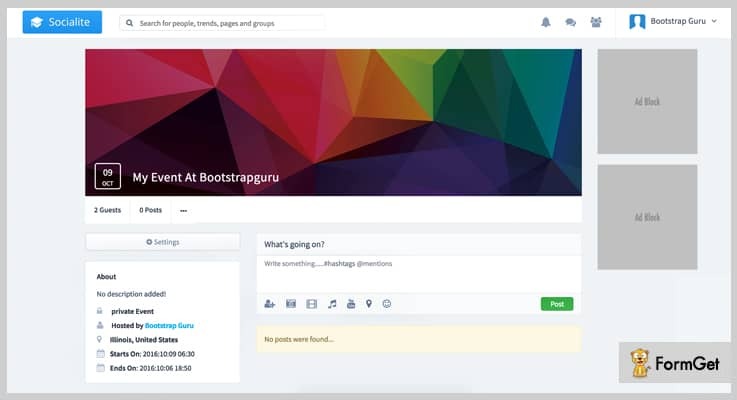 This phpSocial Facebook clone script helps you to create a website which allows your users to interact with each other by live chat, messages, and a lot more. Further, users can connect with various people, also, they can create groups and communicate with each other with ease. In the newsfeed area, your users can view the latest status updates of their friend. Also, users receive updates about birthdays and activities via notification. Users can share their life moments, photos, music, videos, movies, places visited locations, and more in their profiles. In addition to this, users can set privacy like public, or friends for their profile content views. The script supports instant search options which allow your user to search for people, and pages, via #Hashtags, @Pages respectively. 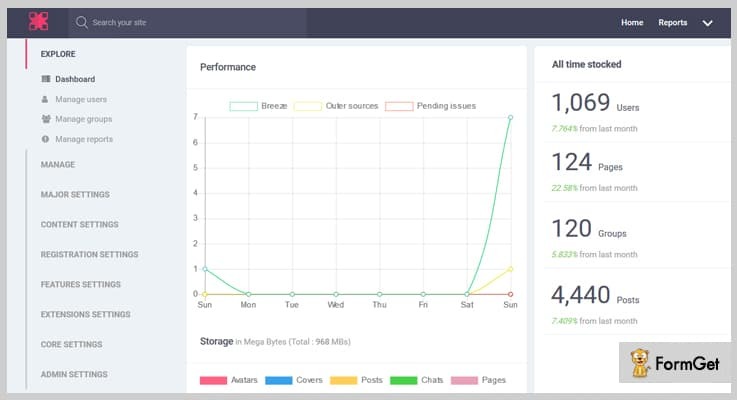 With the help of this script, you will get a sorted dashboard. Here, you can view the quick statistics about the activity of the current day along with activity stats graphs of the last 7 days. Regular License – Available at $49 where you will get support up to 6 months, future updates and more. Extended License – You can grab this plan at $249 with all the features present in the regular license along with some more advanced features. If anyone wants to create a social networking site then, this script is made for them. By using iSocial PHP script, you can start your own social media website in a matter of a minute. The script includes all the features like the other social media site such as post photos, videos, live chat, comments, share’s, and like’s of posts and a lot more. You can allow your website visitors to register on your website with their name or email ids. Also, they can register with their other social networking accounts such as Facebook and Twitter. Website users are allowed to comment or like on each other posts. In addition to this, they receive notifications instantly when someone comments or like their posts. The script helps you to create a site which will also work as a marketplace where users can publish and view the products according to their choice. 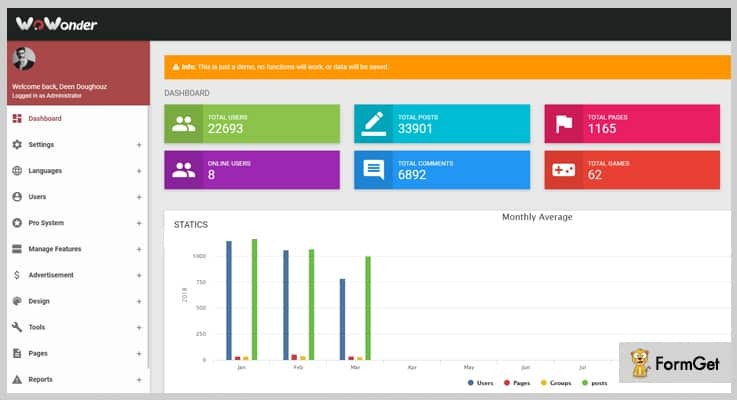 It has a powerful admin panel where you can control your website so, no one can post any unnecessary post on your site. 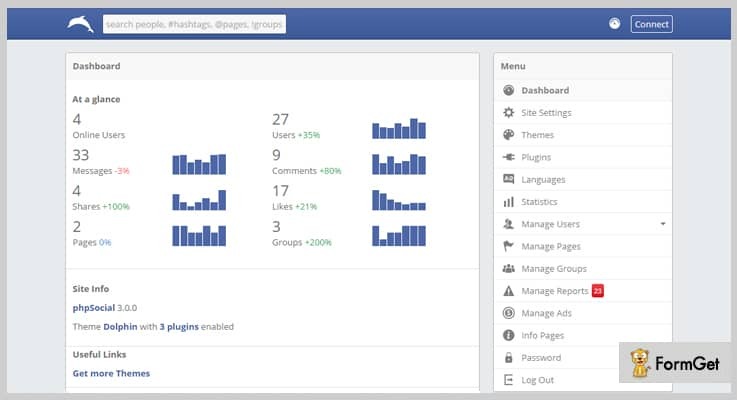 Buy this Facebook clone PHP script at $51 with 6 months support and regular updates. Also, you can extend your support for up to 12 months at $17.25 only. Apply this script on your website and make your site a social networking platform. Here, your website visitors can easily register on your site and create their own social media accounts in the fraction of time. Your users can do live chats with their friends and colleagues with ease. Further, users can do multiple chats at a time and read messages. Moreover, your users can post or view the photos, videos, and more on the front end of your site. It supports AJAX so, there is no need to refresh the page, again and again. This decreases the load time and gives a faster response. The script is secure, you can provide your users with an advanced password encrypted login system with the help of this script. Further, it prevents your website from SQL Injection and CSRF attacks. You can sell the advertising space to your users on your website. Also, you can collect payment from them using payment gateways such as PayPal, Stripe and more. The regular license is available at a reasonable price of $39 with 6 months support. Get the extended license, at $225 where you will get advanced features and regular updates. Breeze comes with trendy responsive design helps you to create an awesome social media website which gives exact FB look to your site. Your users can create their accounts on your site, and create various posts, pages, articles and a lot more. Also, users can comment, like and share each other posts in just a few clicks. To promote your brand or community, you can create pages with unlimited categories. Further, you can create pages along with page title, and page description. It supports inbuilt blog system where users can create articles and publish them on the site. Further, users can get likes, view, comments for their blogs. The script allows users to embed videos directly from Youtube, Dailymotion, and Vimeo. Breeze supports 7th Gen advance search engines where users can search for others profiles with dynamic filters. The regular license of this script will cost you $59 with full support and updates. Further, you can grab the extended license at $505 with some more enhanced features and support. Socialite PHP script helps website owners to create their own modern, simple, and attractive social media website. It gives you various functionalities such as visitors can register and login to your website, send or accept requests from their friends, or colleagues and more. Users can follow or like the pages also, they can create their own page and add members to the page. 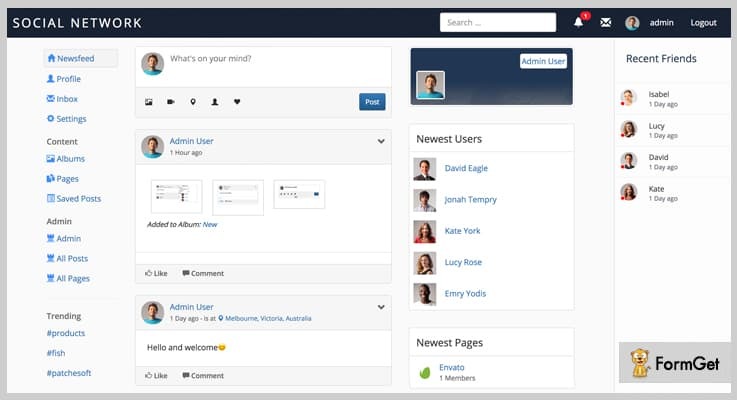 Moreover, page admin can assign roles and permissions to all page members according to their wish. This script helps your users to create events and share it on their profiles along with the location. Also, the script enables Google maps for all the events so, users can get to know the exact location of the event on the map. It makes your website very secure, any user can report other users, pages, groups, and posts if they are SPAM. Further, admin can check reports and work on them quickly. Grab the regular license of this script at a minimal price of $46 with 6 months support. You can buy the extended license at $325 with some more enhanced features, and regular future updates. Now, this is all about 5+ best Facebook clone PHP script. We hope you have found the best Facebook clone PHP script according to your requirement. You can easily create your own social media website after applying these scripts on your site. All the listed scripts are best as per our knowledge you can choose any one of them according to your requirement. If you have any queries, let us know in the comment section below.